Integrate this navigation package with speech synthesis, wireless network mapping and your choice of map data. Live CDs let you turn any computer into a temporary Linux box. 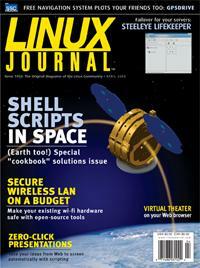 Make it a Linux box with your chosen software and configuration. Take advantage of Openoffice.org's well-documented file formats to create presentations as easily as a Web site. That on-line animation was pretty funny, but how about performing a show live? Here's new software that makes it possible. These command-line stunts will have you manipulating lots of files as easily as you would do one before. The sooner you start, the more time you'll save. Is the latest version of that file on my server, my desktop or my laptop? With Unison, the answer is “yes”. Your Web app doesn't have to be written in some newfangled scripting malarkey. Check out the speed when you try it in C.
Reconfigure servers without changing mount points on the clients with this Kerberos-authenticated network filesystem. If you need to get a satellite launched in a year, think standard parts, creative reuse and shell scripts.